Amritsar is an important part of Punjab. This city is one of the topmost pilgrimage spots for the Sikhs. It houses, Golden Temple an iconic Gurudwara with dome covered in gold, which every year is visited by Sikh as well as Hindu followers in huge numbers. Indian Holiday through well-planned Peaceful Amritsar Tour offers you a chance to pay homage at the Golden Temple. 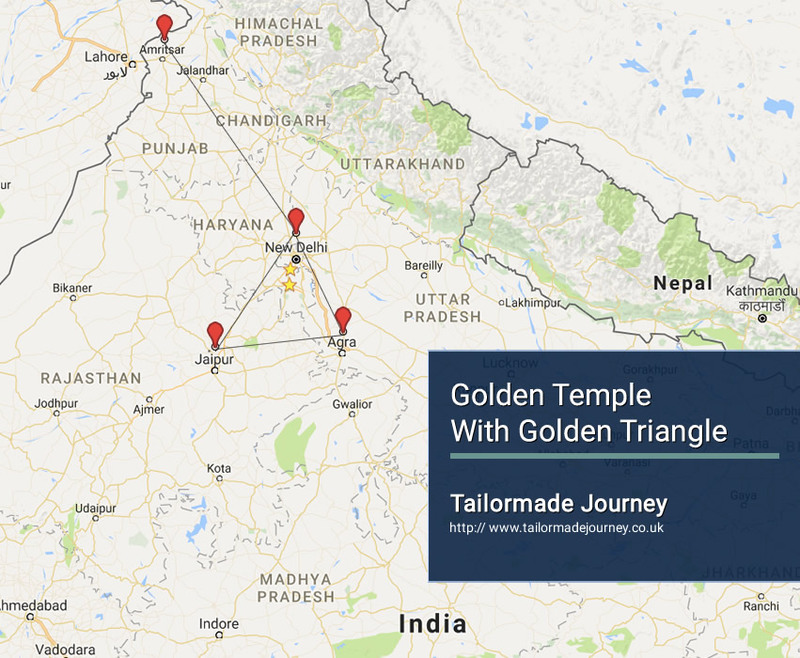 We continue our tour and take the train to visit the Golden Triangle tour is one of the most sought-after tours of India, by which the traveler can experience the vast cultural diversity of the country. During the Delhi Agra Jaipur Tour (Golden triangle), you get a chance to explore, three of the most well-known cities of India. You not only visit some very popular monuments but you will also get to witness the best of the culture of the country. Delhi, the capital city will offer a perfect mix of everything from food to culture to religion. While Agra is a perfect city to view the Mughal glory, Jaipur is a specimen of the Rajputana grandeur. Arrive Amritsar 2 Nights > Train Delhi 2 Nights > Agra 1 Night (Taj Mahal) > Drive Jaipur 2 Nights ( Amber Fort ) > Drive Delhi 1 Night & Leave. Overnight stay at the Hotel in Amritsar . Overnight stay at the Hotel in Delhi . After the city tour you return back to the hotel and relax. Breakfast at the Hotel and Checkout and our company executive would assist you and transfer you to the Indira Gandhi International Terminal 3 to board Flight for Onward Journey. Ritz Plaza is located in Amritsar is 3 km from the beautiful Golden Temple. Free Wi-Fi access is available. Air-conditioned rooms here will provide you with a flat-screen satellite TV, seating area and a minibar. There is also a dining table. Featuring a shower, private bathrooms also come with a bath and a hairdryer. You can enjoy a pool view and a garden view from all the rooms. At Ritz Plaza you will find buffet restaurant, BBQ facilities and a 24-hour front desk. Other facilities offered include meeting facilities, a tour desk and luggage storage. Special facilities for differently abled guests are provided. Guests can rent a car to explore the city. The hotel is 3.0 km from Jallianwala Bagh and 35 km from Wagha Border. The Amritsar Railway Station is 1.5 km. The Amritsar Railway Station is 3 km while the Sri Guru Ram Dass Jee International Airport is 11 km. The property offers free parking. The property houses a restaurant, coffee shop and a bar. Ranjit’s Restaurant serves Indian, Regional and Chinese cuisine while Polaris Bar serves refreshing beverages. Hot beverages can be enjoyed at the 24-hour coffee shop, Café 24. Room is provided round the clock.